One of the many joys of visiting Thailand is the food! Yes, you will find some things that you don’t recognize and some that maybe you don’t want to recognize but Thai cooking has something for everybody. Many Thais like their food spicy (ped) or very spicy (ped mak) but you can always order your food not spicy (mai ped). Don’t be shocked when you see a food cart being pushed down a side (soi) street with many varieties of bugs cooked in several ways- try the silk worms they taste good! Thais like to use all kinds of spices and many times all in one dish - the tastes are excellent. If you think your meal is delicious then it is “aroi” and thank your server and cook with “kob kun krab/ka”. (krab for a man/ka for a woman). And … if you find Thai food too good then you might get Poom pui (fat). 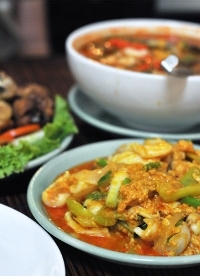 Although Thai food is delicious you might start yearning for some of your favorite foods from home. Fortunately, Chiang Mai has many other choices for food. You will find English, Mexican, Italian, Indian and almost anything else. You will also find freshly made vegetable and fruit juices offered at many restaurants and street vendors. Don’t miss the wafer thin pancakes filled with bananas and covered with chocolate, sugar and sweet cream – leave your calorie counter at home! Get out of the city center and head to the Ping River. Here you find more restaurants and bars (many with live entertainment) right on the river.